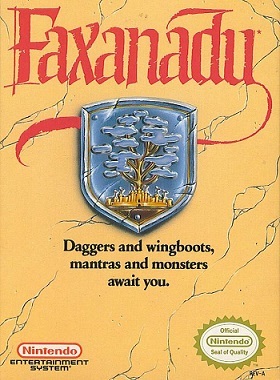 A gem from the NES era, Faxanadu has its flaws but overcomes them with a solid side-scrolling core and platforming fun that makes it well worth its occasional agitations. While I'd definitely count myself among the ranks of those looking forward to the day when the skies are dominated by Amazon drones delivering my games in thirty minutes or less, I'd be lying if I said that I didn't like browsing shelves in an actual store. For instance, about twenty minutes from my house there used to be a movie store that boasted probably the best used game section in Vermont. Atari, NES, SNES, Genesis, Virtual Boy (that one sat on the shelf for awhile); it had at a smattering of just about everything and I loved it. Say you what want about the convenience of online shopping, there's just something about rummaging through a shelf of decades old games that can't be beaten. If nothing else, it's a great way to discover games. 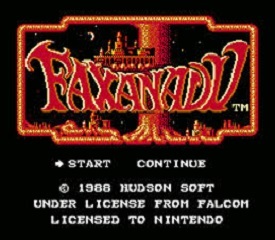 Faxanadu, for instance, is an NES title that I'd never heard of before. Holding it in my hands however and reading the cover art's promise of "daggers and wingboots, mantras and monsters," I felt that delightful urge to bring it home, blow the dust from its innards and take it for a spin. 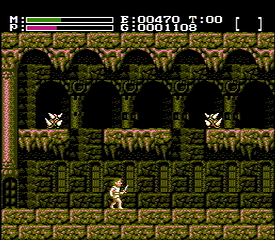 It wound up taking me another eight months before I would actually get around to it (I'm the distractible type), but I've finally given Faxanadu a try and I'm happy to say that it was, overall, a good one. At the game's start, your character returns home to find that their village, one of many nestled in and dependent on the monolithic World Tree, is all but deserted. You soon discover that the magical springs that serve as the lifeblood of the tree-bound societies has run dry and that none of the warriors sent to restore them have returned. You, in turn, are the last hope for your people and soon find yourself on an epic quest to climb the tree and defeat the evil forces at the center of the crisis. What this amounts to in terms of gameplay is a decently solid platformer that very much manages to rise above a number of unfortunate flaws. The controls, for instance, never feel anything less than awkward. When I first started playing, I chalked this up to simple inexperience. The world of retro games, after all, is filled to the brim with controls that take some getting used to. 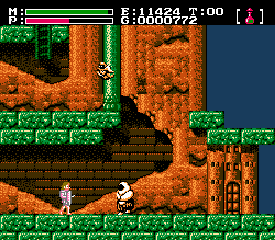 In Faxanadu however, I could never shake the feeling that there was something fundamentally off about the way the player character moves and, most especially, jumps. I was constantly mis-jumping in this game. I literally can't count the number of times I leapt straight into an enemy or fell through the same the hole two or three times in a row because my timing was off by a fraction of a second so small that I often couldn't fathom how I'd missed my mark. This can understandably get you killed a lot which, in turn, is perhaps even more frustrating in this game than it would be even in other platformers of the era. 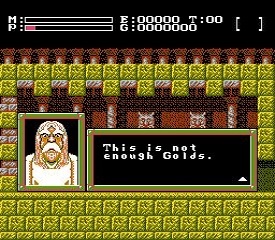 While Faxanadu is at its core a side-scrolling action game, it also incorporates light RPG elements like items and upgradeable equipment that you're flat-out going to need to beat the game. Unfortunately, this adds a bit of gold grinding that will force you to spend decent chunks of time repetitively killing monsters to earn the cash you need to proceed. That might not sound so bad, but it gets worse when you factor in some of the other choices the developers made. For instance, accessing certain areas requires the use of keys, the effects of which are temporary. If you use a key and die, the door becomes sealed again and you have to buy another one to unlock it. On more than one occasion this led me into a nasty cycle where I'd open a door, die exploring, and spend the next twenty minutes dying over and over again as I tried to raise Gold for more keys. I should say that these problems don't kill the game. Even as I sit here considering the niggling issues that bugged me, my overall experience was one defined by looking up at the clock and being shocked by how much time had gone by while I was playing. 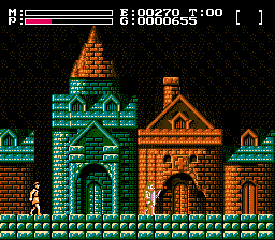 It's funny because, on the surface, you'd be hard-pressed to find much about it that's really all that special about Faxanadu. In fact, just off the top of my head I can think of several more famous games that boast similar features and mechanics. Side-scrolling towns full of villagers to (theoretically) chat with for clues? 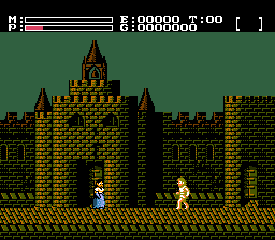 Hello, Castevania 2 and Zelda 2. Platforming action with monsters and bosses? Nice to see you again 75 percent of the NES library. It also doesn't hurt that the game manages to establish a really nice atmosphere. While the color palette is perhaps not as diverse as other NES games, the environments frequently boast a lot of nice detail and are painted in hues appropriate for a landscape contained entirely inside a gigantic tree. A word should also be said for the music which shifts nicely as the game progresses to match the rising stakes of your adventure. Whereas it's borderline chipper at the start, it grows shades more ominous the closer you draw to the ultimate evil behind the catastrophe. What it all adds up to is a game that's not perfect but ultimately still a lot of fun. The controls might have bugged me at times, but hell, even Super Mario Brothers feels a bit weird after three decades. What it all comes down to is that sometimes you really do have to go with your gut when it comes to a game. You can lay out the technical reasons that you shouldn't enjoy something, but at the end of the day all that matters is that you're having fun. Even with its flaws, I loved Faxanadu and I'd be willing to wager that, if you grew up playing NES platformers, you will too. Come back next week to catch my review of Lords of the Realm. As always, feel free to PM with me comments and game suggestions. I've already received two that I'll be writing up in the near future!